The raging Thomas Fire claimed the life of a firefighter on Thursday after charring 249,500 acres of California since early December. Fire apparatus engineer Cory Iverson, 32, died while fighting one of the top five largest fires in California's history, fire officials said. Iverson is survived by his pregnant wife Ashley and their 2-year-old daughter, officials said. 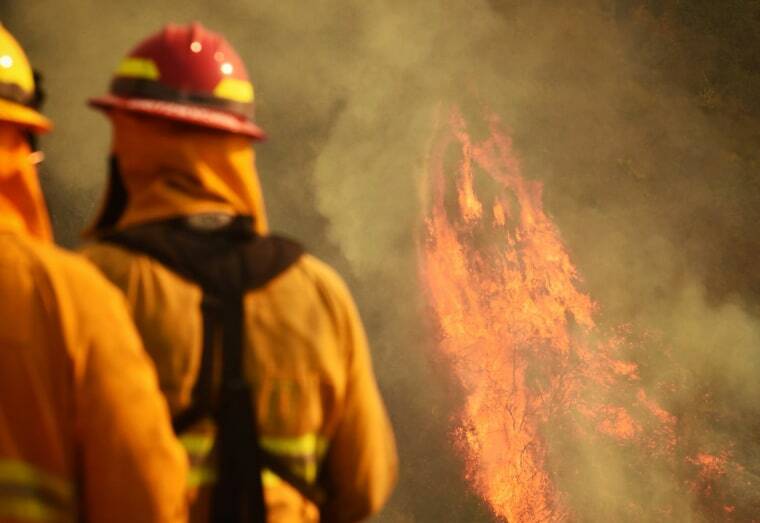 His body was brought from the fire line to the city of Ventura on Thursday evening. "Anne and I are saddened by Engineer Cory Iverson's tragic death," California Governor Jerry Brown said in a statement. "His bravery and years committed service to the people of California will never be forgotten." Iverson worked for the department's San Diego Unit as a member of a fire strike team, said Chief Ken Pimlott, who leads the California Department of Forestry and Fire Protection, known as Cal Fire. Iverson had worked with Cal Fire since 2009. "Our thoughts and prayers are with Corey's family and all of his friends and coworkers," Pimlott said. Pimlott said a serious accident review team would investigate what exactly led to Iverson's death. "Until this review is complete, there is nothing more I can share," he said. One other death has been linked to the Thomas Fire. The body of Virginia Pesola, 70, was found at the site of a car crash last week along an evacuation route in Ventura County, the county medical examiner’s office confirmed. The Thomas Fire started Dec. 4 as a brush fire but grew with the help of powerful Santa Ana winds, eventually destroying nearly 1000 structures and damaging over 250 others, according to officials. After 10 days of battling, Cal Fire said Thursday evening they had the wildfire 35 percent contained. The Thomas Fire has cost the state nearly $75 million, and Cal Fire has ordered hundreds of thousands of people to evacuate in Ventura and Santa Barbara Counties. A Red Flag warning was issued for Santa Barbara and Ventura Counties until 10 a.m. Friday, and a mandatory and volunteer evacuation orders continued northwest and northeast of the city of Santa Barbara. Authorities expect to have the fire — believed to be the fourth largest in California history, according to NBC Los Angeles — contained by Jan. 7, and have tapped more than 8,000 personnel to fight it.